As well as the splendid sword belt the king had a larger belt, one which he was probably wearing as he lay in his funerary ship. This belt was secured by a great gold buckle of a size and quality which is unmatched anywhere. This superb buckle is just over five inches long and weighs nearly a pound (14.75 oz.). It is made of gold of between 80-89 per cent pure gold with 9-17 per cent silver and has been cast and then worked up with a chisel, file, and punch-hammer, to form the elaborate animal interlace design. Close inspection will reveal the heads of the interlaced creatures. 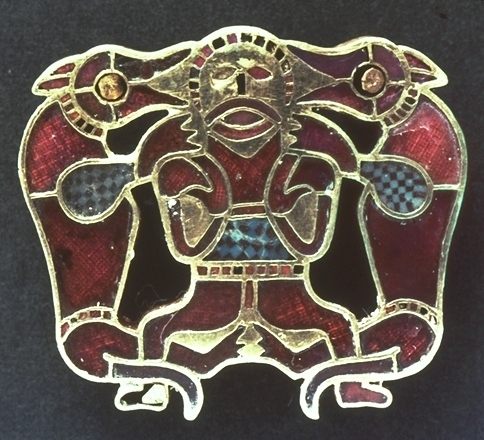 Most prominent are the paired eagles’ heads with stylised hoods – this appears to a distinctive emblem in the treasure. The buckle is actually hollow. It opens at the back (the spring-catch mechanism working perfectly to this day) to reveal a hollow chamber, the purpose of which has yet to be fully explained. 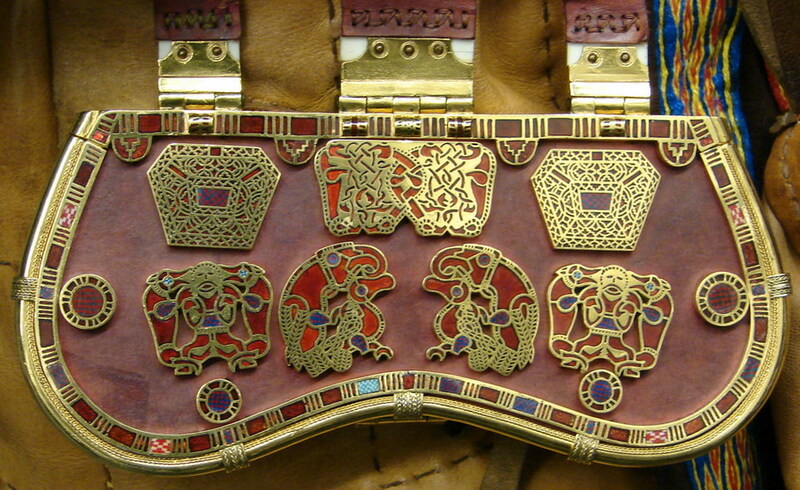 From this second belt hung a great sporran-like purse of fantastically high quality. The leather of the purse had disappeared but the gold contents and wonderful gold lid frame and gold cloisonné mounts have survived. The purse lid about six inches in length and made of gold, 79-85 per cent pure with 11-16 per cent silver, and inset with no less than 1,561 inlays of garnet, blue glass and millefiori, as well as gold filigree-work. Again it appears to be a product of the East Anglian royal workshop, as the uniquely accomplished combination of garnets, millefiori and blue glass indicates. 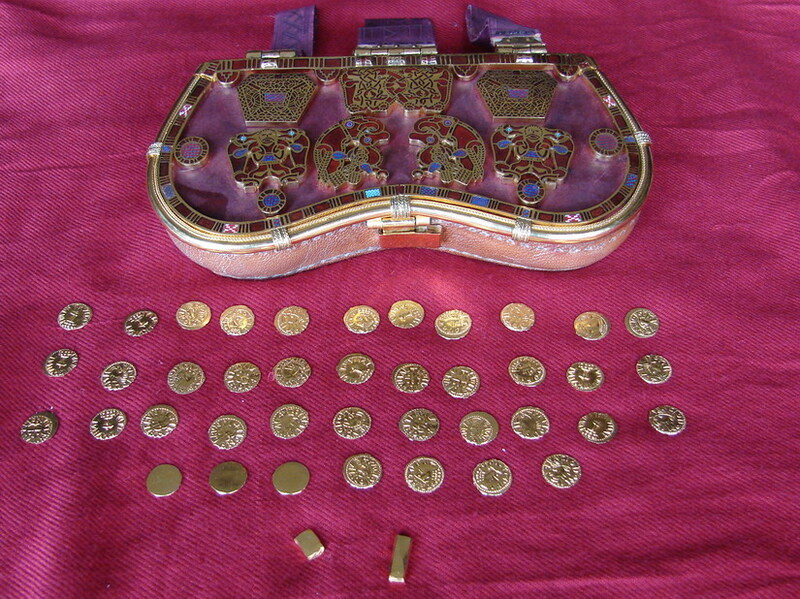 The design of the purse lid also makes use of gold ‘lidded’ cells to enhance the more elaborate zoomorphic interlace forms (a development of the gold ‘beaded’ cell technique observed earlier). The significance of these designs has yet to be properly explored, but there may be some mileage in the view that the eagle was a major emblem of the founding father-god of the Wuffings, Woden. The fact that the designs on the lid are duplicated side-by-side is also curious. Let us now look at the outer duplicated mount, which shows a human male figure between a pair of animals, in higher magnification. This mount has been formed from 90 garnet and millefiori glass gems set in gold and enhanced by 13 gold ‘lidded” cells. The animals flanking the central figure have been identified as wolves and it is tempting to hold the view that this configuration of forms was intended to realise the totemic relationship of the wolf to the Wuffing kings. That they regarded the wolf as one of their special family emblems or totem is implicit in the name ‘Wuffings’, the kin of Wuffa, ‘Little Wolf’. The Old English Wuffingas is also a variant of Wulfingas, meaning ‘the kin (or descendants) of the wolf’, a ancient type of folk-name denoting an ultimately totemic affinity with the wolf. The most well-known story of the wolf with an East Anglian king is that of one of the last of the Wuffings, St Edmund. According to the earliest version of the legend of his martydom, his severed head was protected from the creatures of the wildwood by a miraculous wolf. As well as an association with origins, a totemic animal would also have functioned as a source of knowledge and protective to the family. As such, perhaps the peculiar flanking position of the wolves here may be regarded as representing the ancestral guardian spirit of the Wuffings. For further discussion of this key point and the relation of the Wuffings to the Wulfings of Old English heroic poetry, see my book, The Origins of Beowulf and the pre-Viking Kingdom of East Anglia, pp.106-109, and the references there cited. Inside the royal purse was a collection of 37 gold coins, each one from different mints the kingdom of the Franks (what is now France and the Rhineland). Whoever put this collection together added 3 gold blanks, bringing the number up to 40, as well as two gold ingots. This is a very odd collection of coins indeed and it is not at all clear why the number should have been deliberately rounded up to 40. One rather interesting interpretation derives from the observation that they correspond to the possible number of crewmen which originally manned the ship. Although Edwin Gifford, builder and captain of the replica Sæ Wylfing, believes otherwise, it has been suggested that the ship had 40 oarsmen and two 2 helmsmen. If so, the coin collection might have something to do with the maritime folk belief evident in later Old Icelandic saga sources that it was the custom for the captain of a vessel to carry a piece of gold for every member of his crew as kind of insurance against the displeasure of the deities of the sea. But whatever the significance of this remarkable coin collection, it does enable a fairly confident guess at dating the burial. There appears to have been a consensus of opinion between numismatists for some time now that the coin collection seems likely to have been put together around the third decade of the seventh century. Assuming that the assembly of the collection more or less coincides with the date of the ship-burial, the latter can be said to have taken place around the year 625. This would imply that it may have been the burial of the Wuffing king Rædwald, who appears to have died around the middle of the third decade of the seventh century. Now that we have seen what the king was wearing in the way of belts, it is now time to look at the magnificent mounts adorning his shoulders.